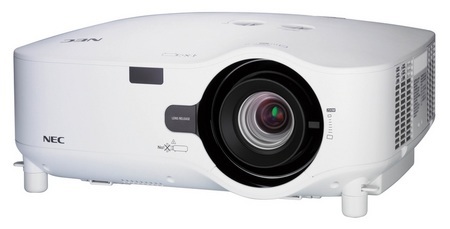 When it comes to projectors, the brand name NEC holds plenty of promise, where they have recently announced a couple more professional installation projectors in the form of the NP2200 and NP1200 which were specially designed to meet demanding integration projects. Part of the powerful NP Installation Series, both models will definitely carve a happy smile on the faces of folks who require bright light output for large screens without having to break the bank. We shall take a look at both models in greater detail right after the jump. First off, the NP2200 – this model is capable of displaying a high level of brightness at 4,200 ANSI lumens, followed by the NP1200 which has a lower output of 3700 lumens. Either way, both models are very bright in their own right, making them the perfect choice for corporate and higher education environments. Eco-minded corporations and individuals will be pleased to know that both models are also energy-efficient, consuming a low 0.4W rating in standby mode by utilizing ECO Mode technology in order to help keep our planet green. All energy savings are documented through the integrated carbon savings meter where you can enable via an optional message at startup. Alternatively, users can also switch between settings via a green ECO Mode button on the remote control. In order to offer maximum flexibility for installers, the NP2200 and NP1200 will come with optional bayonet style lenses for quick and easy exchange. The range of optional lenses are capable of supporting screen sizes from 40″ to 500″ at projection distances between 2.8-feet and 304-feet. Apart from that, the vertical and horizontal lens shift feature also enables flexible projector placement which caters for a variety of installation locations in a room. You will also be pleased to note that both machines boast flexible input/output signal capabilities, ranging from connectors for VGA to DVI-D with HDCP, 5-BNC, multiple audio in/out and RJ45 network control. With the inclusion of a Virtual Remote (DDC/CI), users are able to control the projector directly from a computer sans pesky additional control cables. Expect the NP2200 and NP1200 to ship this month for $2,399 and $1,999, respectively.